The exhibit rentals that we produce in Vegas are highly flexible and can be customized to meet your needs. 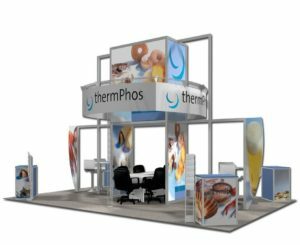 View some of the booth examples below while keeping in mind that you can combine elements from different displays to create a finished product that best works for you and your company. After looking through the different options that we have for you, and once you have a better idea of exactly what you are looking for, reach out to our team of highly skilled professionals for more information on pricing and for a free design rendering. Our services are not limited to just Las Vegas -- we provide our rental exhibits and trade show services all around the country. 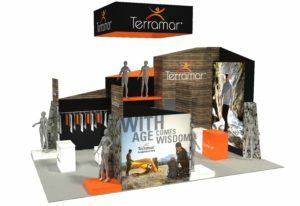 The 20x30 Terramar exhibit is one of our newer and more innovative designs. This display features a lounge area in the center with various other elements such as bars for hanging product, reception counters, and graphic panels. A square hanging sign hovers over the entire booth to complete the company's branding. This 20x30 RBH island booth will make your brand stand out at your next trade show or event. It features counters on each corner with stools where customers can view interactive information on digital monitors. Curved pillar panels create the structure for this exhibit, and a large hanging sign completes the image. 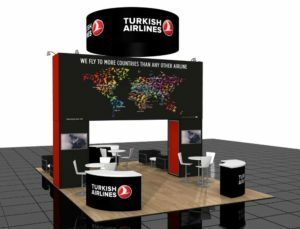 The Turkish Airlines 20x30 trade show exhibit is a rental with an island layout. Stem lighting illuminates a large graphic panel display making it stand out in this booth. Two curved reception counters and various seating areas create an inviting atmosphere for visitors. Complete with a large, circular hanging sign for a finished product. 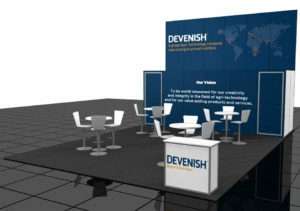 This 20x30 Devenish display is a simple way to market your brand at your next trade show. Multiple seating areas and a reception counter draw in attendees while the graphic back wall panels bring the whole design together. 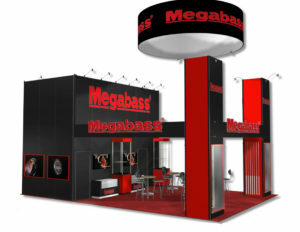 A double pillar design with product display cases makes this 20x30 Megabass booth stand out from the competition. Also, the large circular hanging sign enhances the image of your brand. 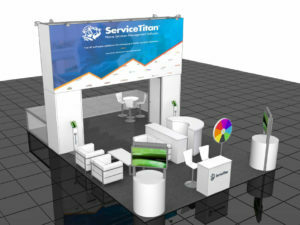 This 20x30 Service Titan island display features many elements that your next trade show booth should have. Large graphics on an overlying bridge panel is sure to draw attention to this display. It features semi-private meeting tables in the back as well as monitors and couches in the front of the exhibit. 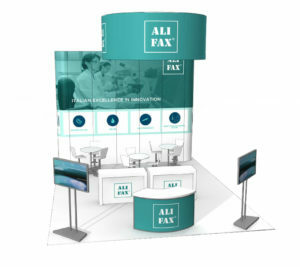 This 20x30 Ali Fax design includes all the must-haves for a successful trade show exhibit. A large hanging sign, curved reception counter, and two digital monitors ensure that your message stands out amongst tough competition. 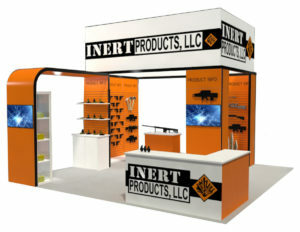 The 20x30 Inert booth encompasses all the great features of rental with a customization made just for your branding. Slat wall shelving units are carefully lit to show your product in the best way. Graphic panels, including a curved panel attached to a tall pillar, give this exhibit a unique, more customized look. Several digital monitors, as well as a front L-shaped reception desk, make this display inviting to passersby. 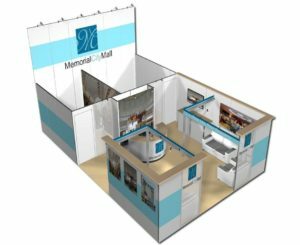 The 20x30 Memorial City booth is an exhibit that features a mostly closed layout. The back of the display features two areas that can be used as private meeting rooms or for additional storage. Out in the front, there is a central reception desk and two lounge areas where clients can sit on the couches while they wait for one-on-one time. The Google 20x30 exhibit is the perfect design for an end-inline or corner booth. Stem lighting enhances your booth and several monitors bring a modern and digital flair that potential clients will love. 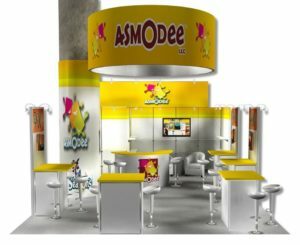 The Asmodee 20x30 exhibit includes all the elements of a successful trade show booth. A large circular logo sign hangs over this display that features several counters with stools, a center curved reception desk, digital monitors, and a private, enclosed meeting space. 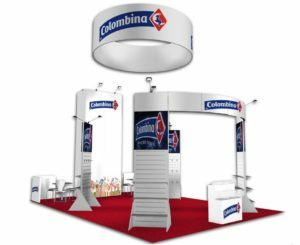 Show attendees will be drawn to the open island layout of the 20x30 Colombina booth. It features an overall industrial look, with a large hanging sign above. Stem lighting on the back wall and various product displays light up your products and offerings to draw in more potential customers. 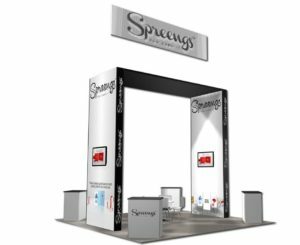 The Spreengs 20x30 booth is a simple and ideal design for an island exhibit layout. Two side pillars and a bridge overlay compliment that large hanging sign above this display. In addition, reception counters on each counter maximize the interaction with potential clients. 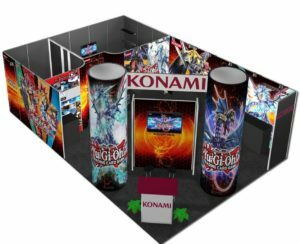 This 20x30 Konami display features colorful graphic panels that will stand out at your next trade show. Two rooms in the back provide additional storage or can be used as a private meeting area. 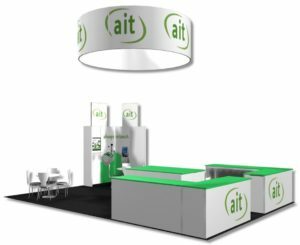 This 20x30 AIT is a unique exhibit that will catch the eyes of trade show attendees. It's simple, yet gets your branding across in a clean cut and modern way. 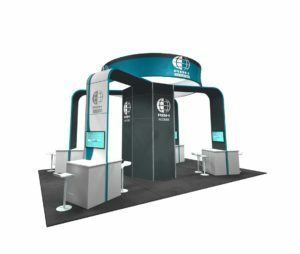 This booth features a large, circular hanging sign and wrap around desks along the front corners of the layout. 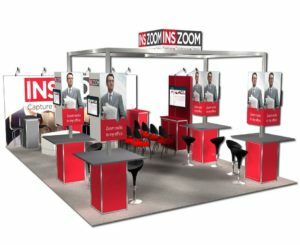 This 20x30 INS Zoom booth is another example of an exhibit with an overall industrial type of design. With metal framing throughout, this display also features multiple stools and chairs as well as digital monitors to better display product or company information. 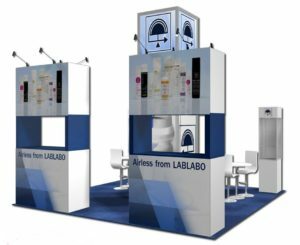 Blow your competitors away with this one-of-a-kind 20x30 LabLabo rental exhibit. Two display cases in the front feature backlighting to enhance your product offering. Additionally, this booth features stem lighting and two small meeting tables to converse with potential clients. 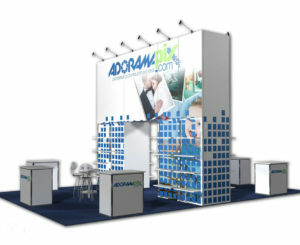 The Adoramapix 20x30 island exhibit is a great layout for your next trade show. The design of this display features multiple reception counters to interact with booth visitors. The graphic panels also include shelving to display product with stem lighting above. 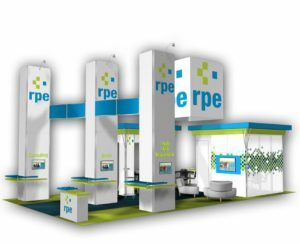 The 20x30 RPE exhibit offers a booth design like none other. Triple pillars set the stage for your brand's image. This design also features a private meeting area in the back as well as a lounge area with multiple couches. The 20x30 Thermphos exhibit features metal framing to give this booth an industrial look. Also included is a central meeting table as well as 4 reception counters located on each corner of this island layout. Find the design that is closest to what you're going for. Our designs don't stop there! We can provide customizable booth rentals of any size such as 10x10, 10x20, 20x20, 30x30, 30ft-100ft & more. Reach out to our experienced team trade show professionals so that they can guide you through trade show rules and design regulations for your particular event. Copyright © 2010 by Metro Exhibits, LLC. All rights reserved.